You can Set this card from your hand to your Spell & Trap Card Zone as a Spell Card. During your opponent's turn, when this Set card in the Spell & Trap Card Zone is destroyed and sent to your Graveya.. If you control a "Utopia" monster: You can draw 1 card. If a monster(s) you control is banished during the Battle Phase (except during the Damage Step): You can banish this card from the field, then t..
FLIP: You gain 500 Life Points for each "Galaxy" monster in your Graveyard. When this card is destroyed and sent from the field to the Graveyard after being flipped face-up: You can Special Summon 1 L.. When a "Galaxy" monster you control is targeted for an attack: You can Special Summon this card from your hand in face-up Defense Position. When Summoned this way, you can: Immediately after this effe.. While your opponent has 4 or less cards in their hand and this card is the only monster you control, your opponent cannot declare an attack. Once per turn, if you control a Level 8 Dragon-Type monster..
You can banish this card from your Graveyard, then target 2 Level 5 WATER monsters in your Graveyard, except "Gazer Shark"; Special Summon both those monsters, but their effects are negated. Immediate..
You can discard 1 card; Special Summon 2 WATER Winged-Beast-Type monsters, 1 from your hand and 1 from your Graveyard, except "Blizzard Thunderbird", then return this card from the field to the hand. ..
Once per turn, this card cannot be destroyed by battle. Once per turn: You can target 1 "Battlin' Boxer" monster in your Graveyard, or 1 of your banished "Battlin' Boxer" monsters, that has a Level; a..
During your Main Phase: You can Special Summon this card and 1 Level 4 or lower Fiend-Type monster from your hand. You cannot Normal Summon/Set during the turn you activate this effect. You can only u..
You can Set this card from your hand to your Spell & Trap Card Zone as a Spell Card. When this Set card in your Spell & Trap Card Zone is destroyed and sent to the Graveyard during your opponent's tur.. When this card is Special Summoned: You can choose either 1 or 2, then excavate that many cards from the top of your Deck, send any excavated Plant-Type monsters to the Graveyard, also place the other.. If this card is sent from the field or the hand to the Graveyard: You can excavate the top card of your Deck, and if it is a Plant-Type monster, send it to the Graveyard. Otherwise, place it on the bo..
Once per turn: You can excavate a number of cards from the top of your Deck, equal to the number of cards your opponent controls, send any excavated Plant-Type monsters to the Graveyard, also place th.. When a "Sylvan" monster is sent to the Graveyard (except during the Damage Step): You can Special Summon this card from your hand. Once per turn: You can excavate the top card of your Deck, and if it .. Cannot be Normal Summoned, unless you control a "Ghostrick" monster. Once per turn: You can change this card to face-down Defense Position. When this card is flipped face-up: During the End Phase, cha.. Cannot be Normal Summoned, unless you control a "Ghostrick" monster. Once per turn: You can change this card to face-down Defense Position. When this card is flipped face-up: Inflict 100 damage to you.. Cannot be Normal Summoned/Set. Must first be Special Summoned (from your hand) by banishing 1 "Bujin" monster from your Graveyard, except "Bujin Hirume". If this card, which was Summoned this way, is .. This card is unaffected by the effects of "Hole" Normal Trap Cards. When this card is Normal Summoned: You can target 1 "Traptrix" monster in your Graveyard; Special Summon that target in face-up Defe..
You can banish this card from your Graveyard; immediately after this effect resolves, Normal Summon 1 "Mecha Phantom Beast" monster from your hand. While you control a Token, this card cannot be destr.. Your opponent cannot target this card with card effects. You cannot Special Summon monsters, except FIRE monsters. 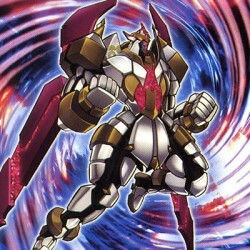 An Xyz Monster that was Summoned using this card as Xyz Material gains this effect. :..